It was late evening and the rest of the family had already gone to bed, I was just about to continue being slumped on the sofa in front of the TV when I decided the dishes needed doing… it was what happened next I want to tell you about. As I washed the dishes I started to appreciate the silence in the house, and at the same time I realised I had not done what I normally do when dishwashing, that is, turn the radio on to occupy me while washing the dishes. I kept it turned off. I started to feel very calm as I washed-up, and also, I noticed that I was not hurrying the process because being late at night I did not have to be somewhere else or doing something else. Washing dishes was all I needed to do right now. By the end of the chore, I felt refreshed and relaxed. I also finished washing up the dishes with the thought that I should wash the dishes at the end of the evening more often! Sometimes the mundane reveals more about us and what is good for us than the exotic or esoteric. 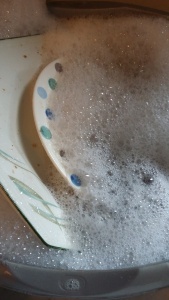 What had happened with the dish washing is that I had also experienced the benefits of a meditational exercise as well as doing one of the chores we all have to do. Meditational instructions tell us to become absorbed in the object of the exercise without distraction, and without planning to I had done this while washing the dishes late at night, so there was nothing else pressing for my attention, and in a silent environment, with no one around either to add to my distraction. I had not gone to sit and meditate, but the result felt the same, and there are times when this is all we need to do for us to feel calm and relaxed. Plus, like many of us, when finishing a meditation, we think, “I must do this more often” and likewise I thought I must wash the dishes late at night again! To meditate is to be fully engaged in the moment, and in this case, engaged in the activity, not to be distracted by thoughts of what we will be doing afterwards because there is a risk that we will not clean the dishes very well nor would we like doing the dishes. Why increase our discomfort with something that needs to be done, by doing it in haste with the mind elsewhere or hating every moment as if we a dragging a huge burden up a mountain slope? Meditation teaches us to be present and it teaches us acceptance: in Buddhism there are expressions highlighting this approach, such as, “when washing dishes I wash dishes; when I walk, I walk; when I work, I work; when I play a game, I play the game”… and so on. Vietnamese Buddhist monk, Thich Nhat Hanh, who lives in France at his monastery Plum Village, is famous for his dishwasher teaching. He used the exercise of washing the dishes as an example of how to meditate, and be present in every action we do. I first read his teaching dishwashing more than 20 years and yet again, on this late evening exercise of washing my dishes I was reminded of his lesson! And this is also important to understand: we often already know what is beneficial and good for us, but we frequently forget and all we need is the reminder, as I got when washing the dishes late at night. A very interesting piece… One to try and adapt to other chores. Adapting a different mindset to mundane activities may prove beneficial.Thank you. Aha that could explain why my husband washes the dishes late at night but I prefer to do it straight after dinner!